Store in a cool dry place. Keep refrigerated once opened. Ingredients: Water, Soybean (15.5%), Wheat (15.5%), Salt, Sugar, Yeast Extract, Acidity Regulators (E296, E331), Dextrin, Licorice Extract. 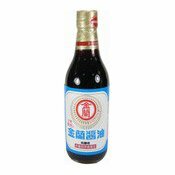 Simply enter your details below and we will send you an e-mail when “Light Soy Sauce With Licorice (金蘭醬油)” is back in stock!